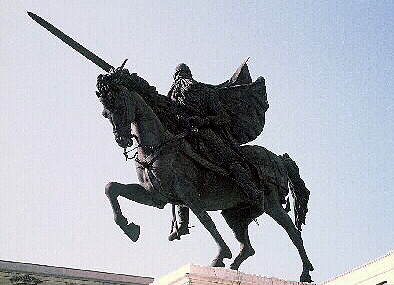 Spanish Hidalgo, born in Vivar (Burgos) towards the year 1043, and died in Valencia, 10 June 1099. The paradigm of medieval hero, elevated to the category of legend through the narrative of his exploits in the peninsular medieval literature, is a real character, a warrior of the middle ages, whose connections with the time are evident, especially with that society's border, created at the mercy of the military friction between Christians and Muslims, but also forced coexistence between both groups in times of peace. With these prior conditions, quite far from the characteristics by which literature portrayed the hero, will attempt to perform the following lines closer to their historical figure. As on so many occasions, the complexity of finding sources on the life of Rodrigo Díaz de Vivar is high, especially to distinguish the cast of objectively historiographic narratives without pollution carried out by its characteristics of medieval hero. In the first group of sources, which might be termed as cronisticas-cristianas, would be considered the history Roderici, the Chronicle of twenty Kings, the first General Chronicle of Spain, and the chronic Adefonsi Imperatoris. All share the nexus to be written quite a few years after the adventures of el Cid, with what degree of literary contamination of their descriptions must be properly analyzed and contrasted in the light of documentary work. A second group of sources would be composed of the Chronicles and Muslim narrations, altogether very important news and responsible, anecdotally, from the nickname "Cid" receiving the hero ('cid' is a Spanish transliteration of the Arabic 'sidi', i.e., 'Lord'). Since the veteran Edition, by E. García Gómez and S. Lévi-Provençal, from the memories of Abd Allah, chronicler of the ziries of Granada, the importance of the Muslim sources from the 11th century in the correct historical location of the Cid has been put highlighted by all specialists in the matter, among which can be highlighted Mª J works. Viguera. On the contrary, such sources has the disadvantage of relying on oral testimonies collected by the chronicler, who argues the views of Muslim military contingent which fought the Christian kingdoms of the peninsula as historical data. Despite this drawback, the sources often, most of the time, validate other assertions contained in the chronic Christian, but this does not exclude that, as in the case of those, the documentary comparison has to be compulsory. A last group of sources, in its entirety, are the literary, that do not extend more words concerning his contamination in historiographical terms. However, also it should be mentioned that it is precisely a literary source, the poem of the takes of Almeria (1147-1150), which finalized the historicity of our character by the Cid of the Chansons de Geste identifying as the same Rodrigo Díaz which existed in the 11th century (Ipse Rodericus Díaz / saepe Meo Cid vocatus). In addition, as with the case of the nickname Cid, is the Latin poem Carmen Campidoctoris (Bibliothèque National in Paris, ms. Latin 5132), responsible for the nickname of Campeador ('campi doctor'), i.e., the interest in the field of battle. Finally, only it should be noted that, while many of its postulates critics about the literary theme have been overcome or currently contested, any historical approximation of the CID has splitting of the studies carried out by R. Menéndez Pidal, especially those dedicated to the historicity of the poem and the comparison between epic storytelling and historical contemporary of Rodrigo. In none of the sources mentioned above it has been established what was the date and place of birth of the English gentleman, although supported as more probable of 1043. 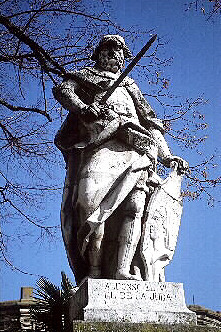 His family belonged to the knightly class, but in the lowest grade, the nobility (is more appropriate for the middle ages refer to this Statute as infanzonia). His father was named Diego Laínez and was the ancestral domain of Vivar, small village located a few kilometers from Burgos. diego Laínez was related with the lineage of Lain Calvo, one of the oldest in Castile, the mythical "judges", although a large number of researchers doubt about the veracity of this genealogical affiliation. After the death of his father (to the year 1058), and as any other time infanzón, Rodrigo was educated in the arts of war, main occupation members of his estate, and at the age of fourteen years went on to serve the King of Castile Fernando I, specifically in the retinue of Prince Sancho, son of Fernando and heir to the throne. The first intervention of the Cid in the field of battle took place in 1063, in one of the internal conflicts between the Peninsular kingdoms, showing well clearly the frontier universe in which are inserted the adventures of Rodrigo. The rich Kingdom taifa of Zaragoza, ruled by al - Muqtadir, was subject to the preferences of Aragon and Castile, as the annual tribute charged for its protection was very high. The Aragonese King Ramiro I, brother of Fernando I, invaded the taifa Kingdom in the year 1063, taking over several territories and initiating the siege of Graus Huesca fortress. The Zaragoza Regulus, who was a vassal of Castile, requested the help of Fernando I, so it decided to send a large contingent of troops to the hand of his heir, Sancho, army where he/she also fought the Cid. The result was the death of Ramiro I, Zaragoza by Castile control, and the first outstanding performance of Rodrigo; two years later, when Sancho was elected King after the death of his father, rewarded him with the position of Lieutenant of the Court, as a reward for his dedication in the battle of Graus. As Sancho's alférez, Rodrigo Díaz de Vivar opened which is his greatest period of activity and intervention in the Affairs of the politics of Castilian, although it is true that there is no too much evidence and that, anyway, their participation must adhere to the control of the border lines between Aragon and Castile, above all in the Zaragoza territory. Anyway, nor should we minimize this participation, as Rodrigo showed fidelity to the cause of rare Sancho at the time when the bonds of feudal loyalty were not all resistant which is intended, in addition to the existence of mercenary warriors was the dominant trend. Following this, it is quite possible that the Cid was one of the strongest bastions of the Kingdom in the call Guerra of the three Sanchos, that pitted the three strongest peninsular monarchies, ruled at the time by Kings homonyms: Sancho el Fuerte of Castile, Sancho Ramírez of Aragonand Sancho IV of Navarre. The participation of Rodrigo in this conflict is based on the literary narration of the Carmen Campidoctoris and Roderici history, so, but without conclusive evidence, it is possible that during these years would place some of the chivalrous challenges, as Jimeno Garcés, narrated by those sources. What does seem to be clear is that Rodrigo participated actively in the military defense of the Eastern Spanish territory, especially on the border with Zaragoza. The war of the three Sanchos at Bay, the Spanish began the struggle to return Castile territorial hegemony, because his father, Fernando I, had decided to divide its territories between his sons; in this way, the segundogenito, Alfonso, was King of León, while a third son, García, was from Galicia. Of common and secret agreement, the two elder brothers began maneuvers to dispossess his Kingdom to García; Rodrigo Díaz de Vivar was in charge of commanding the Spanish troops who faced Galician aristocrats supporters of García in the battle of Llantada (1068). The Spanish invasion of Galicia, in which also participated the Cid, was not completed until the year 1071; in fact, many details are ignored. Alfonso VI, King of Castile. Plaza de Oriente. Madrid. After the occupation of Galicia, differences were to arise between the two brothers, Sancho and Alfonso. Issues of hegemony is positively in the battle of Golpejera (1071), in which Sancho troops, led by the Cid Campeador, defeated aristocracy akin to Alfonso, which had to take refuge in Toledo, taifa Kingdom protected by Fernando I, which, by his own will, had been under surveillance (and the collection of the rich pariahs) Leon, and not of Castile, as it was more logical. However, Sancho el Fuerte believed that Alfonso disappeared, the only problem to achieve their long-awaited territorial recovery was in Zamora, where his sister, Urraca, refused to hand over the fortress, harassed by Castilian troops. In the year 1072, when own King Sancho and his Lieutenant Rodrigo topped the troops that, halfway between the siege and negotiation, besieging Zamora, known episode of Bellido Dolfos, regicide traitor, ended the war and short reign which had been protector of the Cid. There is no doubt that, in any case, the cycle of romances cidianos knew how to capture the rawness of the zamorano episode with greater impression that the historical data. The enthronement of Alfonso VI, heir to the Kingdom after the death of his brother Sancho, is one of the moments of meeting in the literary sources and purely historical sources. On the basis of the epic cidiana (both the poem and ballad), Rodrigo Díaz de Vivar, Sancho's alférez, was commissioned to swear the new monarch who had had nothing to do with the death of his brother. This event, the famous oath of Santa Gadea of medieval literature, has no historical confirmation, except, as says the historian J. L. Martín (art. (op. cit., p. 33), the logic: "only later sources talk about the required oath to Alfonso [...], but it is logical that they demanded a guarantee before crowning him King". Following the same logic, it seems also feasible Rodrigo, one of the most faithful warriors of the previous monarch, to participate in some way in the Act. 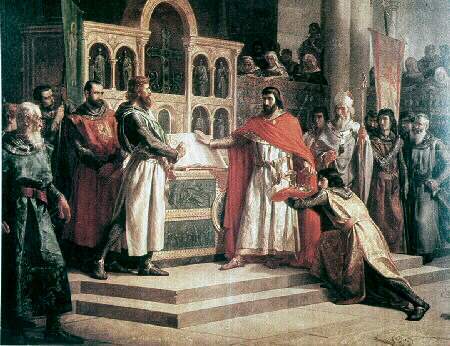 Oath of Santa Gadea. Hiraldez. Madrid. In any case, the topic of which the success of Santa Gadea irrupted forever both characters is not true, at least in the light of historical documents. For example, in the year 1073, King Alfonso ordered Rodrigo to intervene in certain problems that exist between the Burgos monastery of San Pedro de Cardeña and Orbaneja inhabitants, which, in essence, constituted the first contact would have the Cid with the famous Spanish monastery. After complying with the mandate, the monarch authorized your wedding with one of the ladies of the Castilian aristocracy, Jimena, that history Roderici is daughter of the count of Oviedo don Diego, fact that, objectively, cannot be confirmed, since the arras document supposedly original (preserved in the archive of the Cathedral of Burgos) contains severe interpolations made in the 12th century. Naturally, it can also rule out so-called parricide committed by el Cid, murderer in single combat of the father of his future wife, episode whose dramatic content adorned the lyrical legend of Rodrigo but that doesn't offer too many signs of being truthful. In the following years, el cid continued having the benevolence of Alfonso VI: 13 March 1075 attended as representative of the King to the lawsuit Oviedo Church kept the count Vela Obequiz, fact that has supported the filiation of Jimena in the count Diego, as Rodrigo had no link with the Oviedo capital safeIt is clear, the interests of their families. The following year, he/she participated in military campaigns of Castile through which recovered the Rioja alavesa and the manors of Vizcaya and Guipúzcoa to obey Alfonso Bravo. Similarly, in the year 1080, and as proof of his fame and celebrity in the realm, Rodrigo Díaz de Vivar was among those attending the Council of Burgos, in which Alfonso VI decided to accept the Dictatus Papae of Gregory VII, and adopt the Roman Rite at the expense of the Mozarabic, more use in the peninsular liturgy. Returning with our character, it seems that, at least during that year, the Cid in the cutting position was enviable. However, it is also feasible that the aristocratic retinue who had been faithful to Alfonso during the clashes, as the Ansúrez, counts of Carrión, initiated its rise in the political apex of the Kingdom, eager to put an end to the role of Rodrigo had at time of Sancho. Among all of them echoes the name of count García Ordóñez, Leonese Knight who replaced the Cid in the post of second lieutenant and that literature, again without objective justice, did appear in the role of staunch enemy of del infanzón de Vivar. However, there is evidence that, at least, conde García appears to have played for two bands in the dark episode of the pariahs of 1079, when Rodrigo was commissioned by Alfonso VI to collect the succulent morsel payable by the taifa of Seville, al - Mutamid; on his return to Castile, the Cid and his troops were attacked by Muslims from Granada, led by its Régulo, Abd Allah, but that received support in the showdown of the Castilian troops who had gone to collect the pariah, Granada. Coincidentally, was the count García instructing those troops, and was taken prisoner by Rodrigo; return to Castile, both accused of sedition, and Rodrigo took the brunt, because the King has validated the word of García. Similarly, the participation of Rodrigo enemies in the algarada of Muslims from Toledo in the year 1081, is also presumed event that spurred the brother banishment. A small group of Toledo, United extremely protected by Alfonso Bravo before its final conquest (1085), dared to overcome border the Tagus, and the Cid defended Spanish territoriality. Under the prosecution action of count García Ordóñez, and stubborn complaint of the toledan Regulus, al - Qadir, Alfonso VI decided to punish so exemplary intolerable disobedience of his vassal. But again without other objective support that logic, the action of the group which, in the cidiana lyric, ranges from the bad mestureros and bad enemies, seems to have been the cause of the actual episode in the life of Rodrigo. The reality of the singing of the exile was that only a few faithful accompanied Rodrigo de Vivar departure, towards the uncertain exile which, in media res, starts to the Castilian epic poem par excellence. Continuing with the logic, it seems also normal al - Muqtadir, Regulus of Zaragoza, frotase hands with the punishment of the most famous Spanish Warrior: the taifa was one of the richest, but also the most estragado by the tributes paid to Castilla and constant monarchies navarra and Aragon, harassment and the Barcelona counties and urgelitano. Therefore, the need for defense of the King of Zaragoza, as well as the need for support from Rodrigo, made it possible to seasoned Babieca rider to enter in the service of the Zaragoza Regulus. However, al - Muqtadir would only enjoy a few months of the presence of the Cid in his court, because he/she died at the end of 1081. His son and successor, al - Mutamin, Rodrigo had for the first conflict that was to come: his brother to Al - Hachib, Regulus of Lleida, Tortosa and Denia, invaded Zaragoza citing their rights to the Government of Zaragoza, which counted with the help of Christian troops paid by its partners: Sancho I Ramírez, King of Aragon and Navarre, and Ramón Berenguer II, count of Barcelona. Again Rodrigo made good his reputation for CID, since he/she defeated his enemies in the battle of Almenara (1082), in which took him prisoner to the count of Barcelona, who had to pay a large ransom in cash, payment which was included his famous sword wash, a true jewel of the arms industry manufactured in Burgundy who became the jewel of the Armory cidiana. On the death of al - Mutamin (1084), again his son and successor, al - Mustain, Rodrigo kept in the service of their cause, thus had to face several attempts of sedition, led this time by Aragonese troops that, again, were defeated by the Cid. It is not known too of the evolution of Rodrigo in the following two years, although it is easy to suppose you occupied in the surveillance of the border. In any case, two important milestones have to be highlighted in these years, with a subtle catch between the general history of the peninsula and the particular history of the Burgos infanzón: in the year 1085, Alfonso VI conquered Toledo and ended Muslim rule of the old Visigothic capital; but, also in the year 1086, the powerful North African Almoravids, after landing in Algeciras, defeated the Christian Coalition who presented them with resistance at the battle of Sagrajas or Zalaca. These two events took place, as you will see major changes in the life of Rodrigo then: he/she was forgiven of his exile by Alfonso VI and return to Castile, was sent to fulfill a mission which would be the second most linked to its historical development City: Valencia. The events referred to in the preceding paragraph are connected with the story of the Cid in the following way: the conquest of Toledo, was actually due to the Castilian troops derailed a revolt against the Muslim Regulus, al - Qadir, completely inclined to the obedience of Alfonso VI. This one, which did not want to lose a valuable contributor, tried to place him at the forefront of the taifa of Valencia, which collided head-on with the interests of the taifa of Lleida (and Ramón Berenguer) and Zaragoza (and the Cid!) On the other hand, the defeat of Sagrajas acted as sudden galvanizing Christian contingents: the internal dissensions were conducive if the enemy was as weak as the taifa, but before the Almoravid power, the union of all the troops seemed more advisable. In this historical context, messengers of Alfonso VI announced to the Cid, in Zaragoza, the regio forgiveness of his offense. When Rodrigo and his warriors through grand Castiella honors, were sent to protect the weak position of al - Qadir in Valencia (remember that, indirectly, it had been one of the causes of exile), besieged by Muslim-Christian troops of count Ramón Berenguer and al - Mustain, Regulus of Zaragoza (who, just a few months earlier, he/she was serving Rodrigo). To break the idyllic time lived between the Cid and his new and Regal Lord, again seems that suspicions, and not only in literature but also in reality, point to the bad mestureros, namely the enemies of Rodrigo in the Castilian court. The eagerness of Rodrigo to protect Valencia attacks enemies caused a delay in excess to the order of Alfonso VI to Toledo, which was to be allegedly besieged by the Almoravids. Delay acted as a trigger of the second brother exile: al - Qadir, the hitherto faithful servant of the interests of the Castilian King Bravo, dissociated itself completely from your obedience, was proclaimed independent of Valencia Régulo, and naturally became the loyal services of Rodrigo Díaz de Vivar, again forced to wandering "mercenarism", so that it was the arm military Government. The situation was critical for the hero: on the one hand, it was not obliged to accept the offer of the shrewd Al - Qadeer, but, on the other hand, in the case of Spanish attack on the walls, should choose to defend his Lord, which had pledged his word of honor, or not fighting against its origins. The solemn oath to al - Qadir that never empuñaría gun before Christian troops is, in essence, one of the many literary contaminations of the historical reality, much more abundant in the last years of existence of the good vassal, which seemed to have definitively found that good man sued by medieval. The Almoravid harassment to the capital of the Turia was constant between 1083 and 1099, but also the intervention of other powers in the area. Thus, in 1089, the army of the new, Berenguer Ramon II, count of Barcelona besieged Valencia, although the strategy of the Cid to desist from his efforts. On the other hand, Alfonso VI returned to require the services of Rodrigo in Aledo (Murcia), part of a futile campaign of conquest of the region. El Cid, knowing that the rupture was ultimately apologized wielding the siege of Berenguer, which contributed to cool all the curious relationship between King and vassal love-hate. The following year, a new offensive of the warlike catalan count was cut from root by the Cid and his troops in the battle of Tébar. Since then, the Muslim power provoked that the troops of the different Spanish Christian kingdoms not imagine the area (freeing the Cid of your heavy burden of honor), until the death of al - Qadir (1092), at the hands of a group of quintacolumnistas related to the Almoravids. In theory, the successor of the deceased Regulus was his son, Yusuf al - Qadi, but in practice was the own Rodrigo who, independently (and not obeying to Alfonso VI), took control of the city, far more visible situation following the death of Yusuf in 1094. In the five years that the Cid led the city, signed two pacts with the count of Barcelona and the Spanish monarch that guaranteed the protection of the square for the Christian cause in Exchange for aid, reinforcements, and the promise of non-intervention Catalan and Castilian, question that both rulers, fearful both of brother power to the almoravidethey accepted gladly. He killed Bucar, alen Sea King, e d'Oro val won to blight, which mill frames.Overcame the wonderful battle e grant. In the following years, el Cid continued with this work of shoes against the Muslim invaders. Proof of this is the battle of Quart (October 25, 1094), in which the Almoravid outpost was denigrated, or the campaign of territorial devastation carried out, between 1097 and 1098, in the area of the Valley of the river Júcar, along with troops from an unexpected ally: the navarro-aragones monarch Pedro I. Despite the occupation of Alcira (August 15, 1097), the brief Dominion of Murcia (may 1098), or the taking of the capital of the taifa of Murviedro, Sagunto (July of 1098), the raids closed with a deep regret for Rodrigo, since his only son male, Diego Rodríguez de Vivar, died during the battle of Consuegra (1098)a vain attempt to expand its influence to the west peninsular. Back to Valencia, el Cid barely survived a year, embattled between subsidiary loss pain and the ever-expanding koubba siege. The day was June 10, 1099, at the threshold of a new century that, however, would mean the explosion of his legendary aura. After the death, was his wife, Doña Jimena, which took charge of the City Government, under equal conditions than her late husband: autonomously with respect to Castilian and catalan Governments. However, the desperate situation made this, and with it the troops of the Cid, they were returned to Castile in 1101, little until the city was taken by the Almoravids; among those who returned to Burgos, of course, also was the corpse of the hero, who was buried with full honors in San Pedro de Cardeña. Possibly, this action was the sociological hotbed where the most fabulous legend of Rodrigo was hatched: the beat a battle after his death. It doesn't seem unreasonable for a Christian of the time, in Valencia to die and be buried in Castile was, of course, win an extraordinarily complex battle. Although, officially, 1099-1101-chronological segment marks the beginning of cidiana legend, you can still set some historical considerations about their offspring. Again appealing to the logic, it is possible that Jimena return to Castile, well to share faculty with the remains of the hero in Cardeña, either (and somewhat more likely, since the historical objectivity) to govern their stately Vivar domains. In any case, Jimena would not take much to accompany him, died in 1104. With regard to the children of the marriage, the plight of Diego Rodríguez, male; has been previously the two daughters of el Cid, interestingly, have been the most interesting literary manipulation, from the name (Doña Elvira and Doña Sol were, in fact, Doña María and Cristina donà), as well as especially in the theme of your wedding. Although again the epic drama of the affront of Corpes look blurred by reality, far from the historical veracity that the daughters of el Cid is marriage with the infantes of Carrión, the Ansúrez, as it has been on the front lines, were fervent detractors of Rodrigo Díaz de Vivar. In this sense, is one of the clearer political legend manipulations and, in particular, of the epic poem, as the author intended, thus, highlighting the value of the small hidalgo above the insidious nobility courtesan, putting at the disposal of the Cid which, perhaps, reality was denied: the possibility of revenge. The handling is even greater if you have in mind that, at the level of the historical reality, marriages were much more profitable than the literary, as by long lineage that the counts of Carrión have, you could compare infante Ramiro Sánchez de Monzón, married to Doña Cristina, and the count of Barcelona, Ramón Berenguer III, married to Doña María. In fact, in the first case, the child of both spouses, García Ramírez, was, walking time, King of Navarra, contributing to restoring the independence of this Kingdom to Aragón, action that earned him the nickname of García Ramírez the restorer. Which a descendant of the Cid to occupy a throne peninsular, in addition to a worthy CODA to the evolution of Rodrigo Díaz de Vivar, also meant another salvo in the legendary hero characterization, because from that descent, by all the medieval Royal houses of the peninsula ran the sanguineo-genealogico reguero cidiana lineage. What better end for the good Castilian hidalgo? Already during his own vital future, Rodrigo Díaz de Vivar, el cid, received the bitter reward of double standards, calibrate this significant in several aspects: on the one hand, the dubious relationship with Alfonso VI and the Castilian nobles, and on the other, extraordinary fame for their warlike actions between his soldiers and among the common people, in general. Identical duality received by Muslim chroniclers, one of his many enemies, which did not cease to praise his military capacity, at the time that spent you the most hurtful epithets precisely to serve a God that was not true, statement is that, really, is very similar to the good vassal if oviesse good Lord! with which it is drawn in the Poema de Mio Cid. The lyrical hero jumped from reality to the legend, but, in Exchange for a privileged place in the heart of Fame, his figure has suffered constant and gruesome manipulations. The first of all is the literary, but he/she does not speak more than for two reasons: first, because sufficient historical data have already been given as to contrast the reality of artistic design that has passed to medieval literature, in particular, all topics based on it: Castilian loyalty, sapientiae et fortitudo of his character, and lyrical ability converting military into a quasi Christian evangelical figure, with conversions of conceptualisation and construction of churches included. Secondly, the artistic aim of the cidiana gesta is, however, the more innocent and beautiful of the manipulations that may suffer the objective history of a character who, like el Cid, should most of their knowledge to future pens, and not to his mind and extraordinary skill with a sword. In addition, the medieval society of the peninsula after Rodrigo sociologically demanded a figure of their entity and flashy, so what the genesis of the epic of el Cid, in turn, forms a part of that whole general which is the story. Following manipulations, and a cruel paradox, is the story that has brought the greatest injustices to the CID. In principle, the recovery of its evolution by the historiography of eighteenth-century, influenced by certain aftertaste of romanticism, visible on pseudohistoriadores as Modesto Lafuente, seemed to elevate him to identical place that occupied in the literature when, actually, was digging his grave. To the idealism of the 19th century attracted him his streak of conservatism Puritan, question that, at the end of that same century, was cruelly attacked by the current regeneracionista that, since a few vital tenets unsettling, fiercely attacked a so-called intolerable and uncompromising conservatism of the Cid. The own Joaquín Costa, prominent member of Spanish regenerationism, did not hesitate to say that the solution was going "through cast double key to its grave that does not ride again" and blamed for all the ills of Spain. In the complicated Spain from centuries, deaf recovery of his figure in the poetic field, highlighted by those poets of the generation of the 98 who, like Machado or Azorín, also felt his austerity of the Burgos infanzon, was accompanied by the weighted work of the aforementioned Menéndez Pidal, though, again in a sad way, the triumphant faction in the Civil War wouldn't hesitate to scupper this recovery objective. Franco's historiography became CID an ahistorical character, without past and reality, to become the champion of a crusade not just positive and national, non-existent in the 11th century, had other connotations, in the 20th century. This is how that often fought defending the interests of Muslim wrens became the champion of the peninsular Christianity against African peat; the twice banished Knight became the ideal of godly loyalty, as the resource of the weakness of a King, Alfonso VI, who had been responsible for the conquest of the imperial city could not even be used. El Cid and Valencia, for example, went on to become a mere and falsely Exegetical precedent for general Moscardó and the alcazar of Toledo, and the own "Cid" went on to be translated with the dubious sense of "warlord", whose obvious childishness is not necessary to describe more. Only Philology, classical, Spanish and Arabic, kept lit the flame of reality. Into the 1970s, the current historiographical Structuralists, of any ideology, waived a character which, considering their historiographical development, had become a mass of battles without any scientific interest. Only in the 1980s, interest in the description of the border situation returned to return to his figure, with justice, asserting with certainty the visible contradictions of a poorly known time. Despite this slow but steady recovery, the scene at the end of the 1990s, between wooded maremagnum of historiographical currents, was not exactly rosy. On the one hand, the neopositivism again highlight the components that can be demonstrated neatly, without daring to challenge to analyze the literary sources with a new methodology, and thus aborting any attempt to approach objective to Rodrigo Díaz de Vivar. On the other hand, the nationalist historiography passed over her figure without just remorse, fearing wake any of the nationalist ghosts, and seeing it as a crude and manipulable representation of a non-existent Spanish imperialism. Among the prevailing disinformation in the more modern times and obsessive saturation of more distant times, the only recommended solution is the approach to the Cid, Rodrigo Díaz de Vivar, without rancor, without any pretensions, and without any false hopes. Only thus will be possible to recognize a contradictory character wrapped in an equally contradictory temporal context, with the border as more noticeable ally, so that in this way, each one of those interested in discovering his reality contributes to close cidiana scar in its twofold: take double key to its grave, burying definitively manipulations of the past, and Rodrigo-help to, truth, beat his last battle after his death, albeit in modest historiographical terms. Martin, J.L. "The sword of Castile". (The adventure of the story, 5 [March, 1999], pp. 30-36). MARRERO, j. & monk, to. On the roads of El Cid. (Burgos: 1995). MENÉNDEZ PIDAL, R. The Spain of the Cid. (Madrid, CSIC: 1969). MONTANER, a. (ed.) Cantar de mio Cid. (Barcelona, Crítica: 1993). OLAIZAOLA, J.L. El Cid, the last hero. (Madrid: 1990). SMITH, C. (ed.) poem of Mio Cid. (Madrid, Cátedra: 19943). VIGUERA, M.J. The taifa kingdoms and the Maghreb invasions. (Madrid: 1992).